Set up as in diagram. 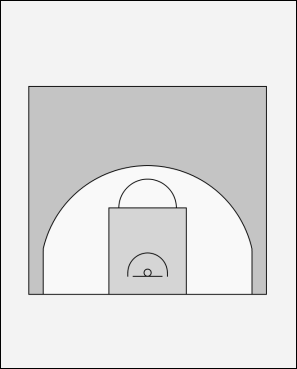 Coach (C) passes to the wing (1). /1\\ must close out high side (no middle penetration). (1) skip passes to (2). Defense adjusts to split-line and closeout to ball. (2) plays live and drives baseline. /1\\ must stop the penetration outside the lane and call "JUMP". (2) hook-passes out to (1) who has re-located into the corner for the shot. /2\\ must leave his man (jump) to closeout on (1) as he is now the player with visibility of the ball.